What do you do when you're a struggling tech colossus losing 100 billion yen a year (about two million pounds a day)? Re-brand, of course! 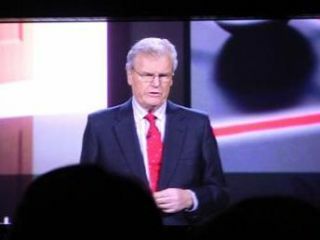 Sir Howard Stringer, Chairman, CEO and President of Sony, stood up at IFA and unveiled a new, group-wide brand message: make.believe. Pronounced 'make dot believe' (make her believe what? That the laundrette is closing down? ), the message is meant to symbolise Sony's "spirit of creativity and innovation" and is the first time that Sony has introduced a single overarching brand message for all of its entertainment and electronics businesses around the globe - electronics, games, movies, music, mobile phones and network services. Is it April 1 somewhere in the world? "As we move to transform Sony and integrate the very best in electronics, entertainment and technology into the homes of our customers, the importance of an all-encompassing and unified brand image is more important than ever," said Stringer. He went on to say that: "Make.believe will differentiate us from countless competitors." Which you could really read in two ways. There's even a little story behind the message, according to the official press release: " 'Believe' is the power of inspiration and 'make' is about crafting inspiration into products and experiences for our consumers. The 'dot' is the place where they meet – and where magic happens!"